The Fourth of July holiday is always a special time in Branson. Guests to Branson during this time will get to experience some of the best firework displays and special events to celebrate America’s independence! Several firework displays will take place during this time. On Monday, July 3rd, the Branson Landing will host a firework display. 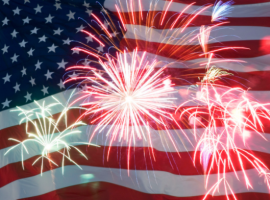 On Tuesday, July 4th, fireworks can be seen at Big Cedar and in Hollister. Hollister will also host a special Firecracker run that morning! The “IT” show, featuring the Hughes Brothers, will also have a special Independence Day show that evening. With numerous firework displays and events in town, you won’t want to miss spending your Fourth of July in Branson!